Hello and welcome to another brand new post of LLG! This post just so happens to be my 3rd post in a row since my period of uncertainty. It feel pretty good to finally be getting back to a more stable schedule. But today we have a lot to Cover so let's get started! For the H.P. of the day I have this ok-ish page in my sketch book. First of I'd like to note the full pencil drawings other than the face in the middle. These are drawings of bits or whole parts of people or things that I saw. for instance, the horrible sketch of a sink was done during my physics class. As you can tell it did not go very well... On a slightly better path, The sketch on the top right of a person in a chair was one I quickly sketched out in about a few minutes ( since people usually move ) and I was pretty proud of it. 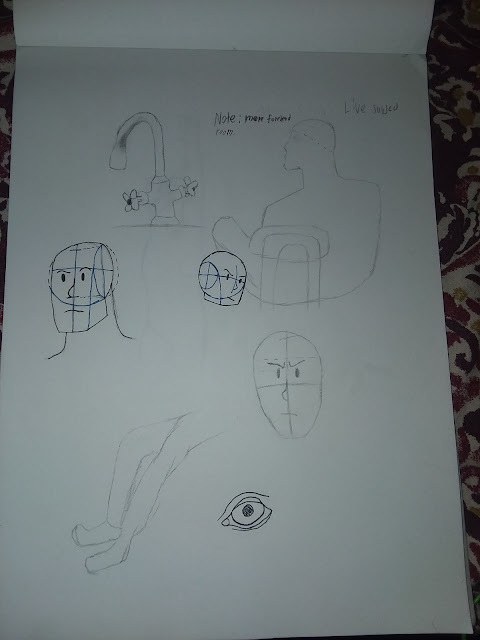 During the process of it, I tried to utilize the practice of using simple lines and shapes in order to get the basic shape of the body ( most prevalent in the neck downward ), but then tossed that when doing majority of the head. Moving on to the eye ( which may look familiar to some) which was me trying out for the first time a tutorial on Deviant Art right here! I am going to try this multiple times so do make sure to try and keep track on it. Lastly, the multiple drawings of the heads were done so that I could try and nail head shapes in all angles as much as possible. It is also worthy to note on the pen drawings that the blue is used on the guiding lines while the black is used on the actual shape. As far as HP of today we are done so lets head onto the next thing. Those of you who check my " Contact Me " page would know that I recently up-ed my social media presence. I added not only a Instagram ( here ), I also added my YouTube channel ( here only one video though at the moment), and a snap chat ( just check the page.). I am going to try and make sure to use these mediums in order to better spread the blog and also connect better with you guys. This brings me to the fact that no matter how hard I try that I can only get so far which is why I ask you guys to share this blog with anyone you think would enjoy it. I work very hard on it and would really appreciate it! That's enough of self advertising. Any of you guys who follow my Instagram would know that I have opened a new contest for you guys to participate in! I've been working on a book series, as many of you know, and I've found out that the tittle and cover are not the best. This is why I decided to work on the cover and ask you guys if you have any ideas for a tittle. The link to the story will be located right ( here ) so that you can read it to get a better idea of what it is about. Not only can you do that, but you can also give me some tips for improvement as it is my first series and it is thought out to be very visual rather than wordy so it is going to have many flaws that you can help me with. The only insensitive at the moment to do these things is from the goodness from your heart since I don't have much to give but I can make a shout out if that is what you want or maybe at some point I could even make prints from my shop as prizes. That last one is just an idea at the moment so let me know what you think of it so I can work on it. The last thing I would like to bring up is the fact that as of the Friday that just passed, I have only 1 or 2 more football games to attend as a band member. This means that post will have near to none interruptions so the likely hood of me missing a post is very unlikely. That's all I have for you guys for today. I hope you enjoyed it and till next post, I'll see ya'll later! Make sure to check out my Print Shop ( here )!